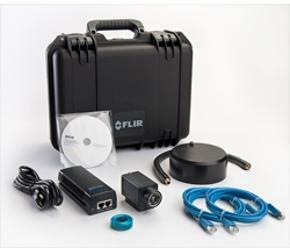 Flir Systems has introduced bench test kits based on its A5sc, A15sc, and A35sc long-wave infrared cameras to permit real-time thermal imaging and analysis for machine-vision and test-and-measurement applications. The cameras serve as nondestructive, noncontact tools that help eliminate temperature-measurement guesswork during the product-development stage, as well as on the production line. With the ability to see heat patterns and extract temperature values via live and recorded imagery, the cameras can replace thermocouples and spot radiometers. The A5sc, A15sc, and A35sc cameras offer resolutions of 80×64 pixels, 160×128 pixels, and 320×256 pixels, respectively. Standard features include plug-and-play compatibility through GigE Vision and GenICam protocols and a 60-Hz frame rate for streaming images. Each kit includes a hard transport case, infrared camera with lens, gooseneck table stand, focus adjustment tool, PoE (Power over Ethernet) injector, Ethernet CAT-6 cables, and Flir Tools+ analysis and recording software.